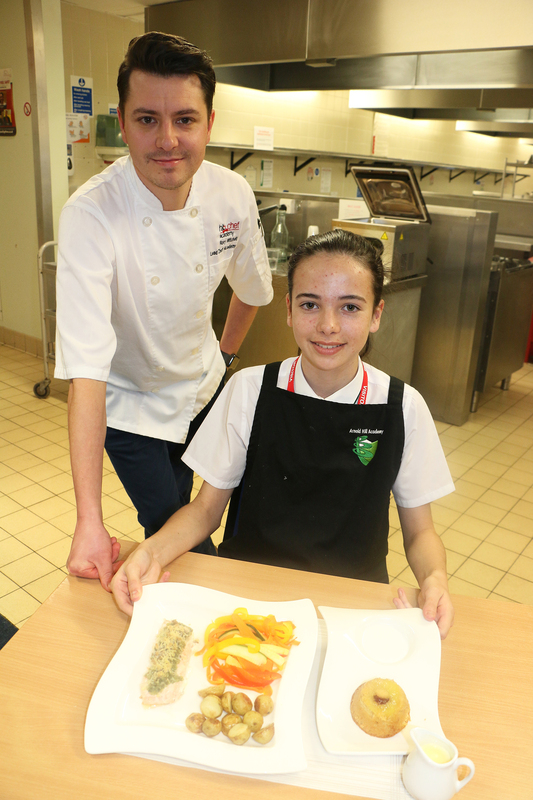 Young chefs from seven Nottinghamshire schools were up to a culinary challenge last week when West Nottinghamshire College played host to the Future Chef competitions. The competitions, which are run by hospitality, leisure and tourism body Springboard, saw thirteen schoolchildren cook up a two-course meal in timed conditions, within a £7 budget, in the college’s Relish kitchens on Friday (23 November). The young chefs went head-to-head and prepared and cooked a main course and dessert while judges scored them on criteria such as workmanship, skills and techniques, creativity and presentation, competition, menu choice and of course, taste and flavour. The winning chef was Charlotte Norris, 13, from Arnold Hill Academy in Nottingham. Her winning dishes of roasted salmon with a crusted pecorino and homemade pesto topping served with mini roasted potatoes and vegetables, followed by apple upside down pudding and homemade custard impressed the panel of three chef judges, and will see her compete for a place in the final on 8 February 2019. “Today I’ve seen really high standards; it sounds cliché, but it’s true. I’ve watched catering standards rise every year on the Springboard competitions. It’s quite obvious the youngsters are pushing themselves more and more and are thinking about food flavour as well as the presentation. “What swung it for me and the other judges, was the meticulous way in which Charlotte worked. She created everything from scratch, and remained so calm under pressure, and she worked like a professional chef. Charlotte will now be mentored by Rory, who is a chef academy lead at HIT training. After Christmas Rory will welcome her to a chef academy so she can see how people in the industry work. After this he will visit her at school a few times to perfect her competition dish and give her professional hints and tips. Charlotte won a professional cookery book as well as books and magazines, and vouchers to use in the college’s Refined restaurant. “It was a pleasure to host the Future Chef competitions in our training kitchens. Every participant worked creatively and professionally and I was incredibly impressed with the high standards produced.